The idea of robots flying through the sky are no longer a science fiction dream. Drones, or unmanned aerial vehicles (UAVs), are being used around the world as means of recreation, government strategy, and global development. Like all technologies, these machines can be used for nefarious or destructive purposes. However, drones are being used in a variety of creative ways to advance the SDGs, including peacekeeping, combating poverty, and delivering aid. 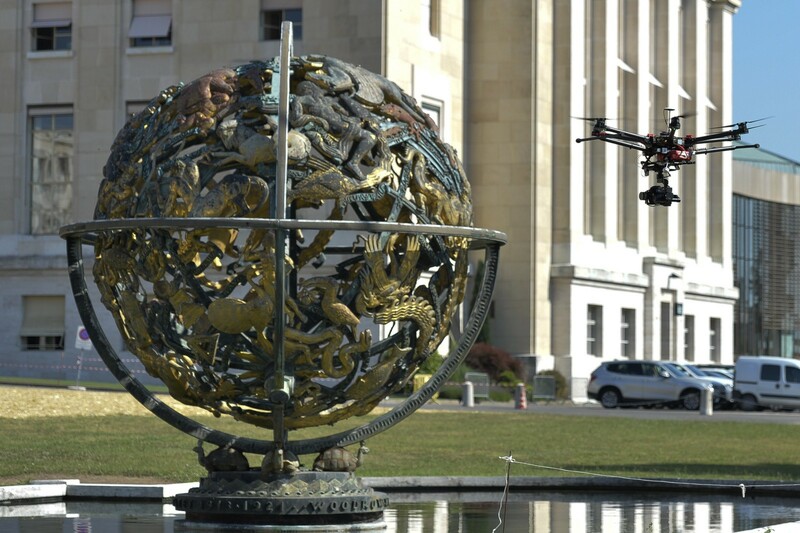 The UN is actively exploring the uses of drones and working to address both the technology’s positive and negative outcomes. Read on to learn how! Delivering aid and other development materials can be costly, time intensive, and dangerous — especially during times of conflict or crisis. Drones are being utilized by UN agencies and other organizations to deliver materials such as vaccines, contraception, and humanitarian aid. UAVs reduce the time it takes to deliver these items, for example, a journey “from an urban center to a rural location that used to take two days now takes 30 minutes.” The increased pace and accessibility of delivery can mean more lives saved. In addition to delivering life-saving aid, drones are also being used to monitor crises by capturing images and video from the skies. This new data is then fed to organizations to help them find safe routes for disaster response, design more effective development programs, and to identify and monitor new or ongoing crises. For example, drones are delivering information that helps WFP to lower the amount of time needed to understand the impact of disaster, enabling them to respond to hunger more quickly and effectively. Haidar Baqir, an IT engineer swho launched WFP’s drones-against-hunger project stated that “the hard part is to arrive at a global regulatory regime that allows us to fly our kit safely, reliably and effectively.” That is why the UN is working to set up frameworks for the use of drones and other emerging technologies. For example, the UN’s International Civil Aviation Organization has proposed the formation of a registry to remotely identify and track unmanned aircraft, along with their owner and operator. The UN Secretary-General’s High-level Panel on Digital Cooperation will address these types of technological questions at an even more macro level by setting up cooperation across domains and across borders help realize the full social and economic potential of digital technologies, mitigating the risks they pose, and curtailing any unintended consequences. Have a drone solution that has the potential to benefit humanity? Apply to UNICEF’s Innovation Fund here (deadline is August 3). Join +SocialGood throughout August as we explore the many ways drones and UAV solutions are being used to progress the Global Goals. Share your thoughts, solutions, and ideas with #SocialGoodTech! Stay-tuned for our #SocialGoodTech Twitter chat on drones for development! More information to come soon. A global community of changemakers united around a shared vision for a better world in 2030. A project of the UN Foundation in support of the United Nations.